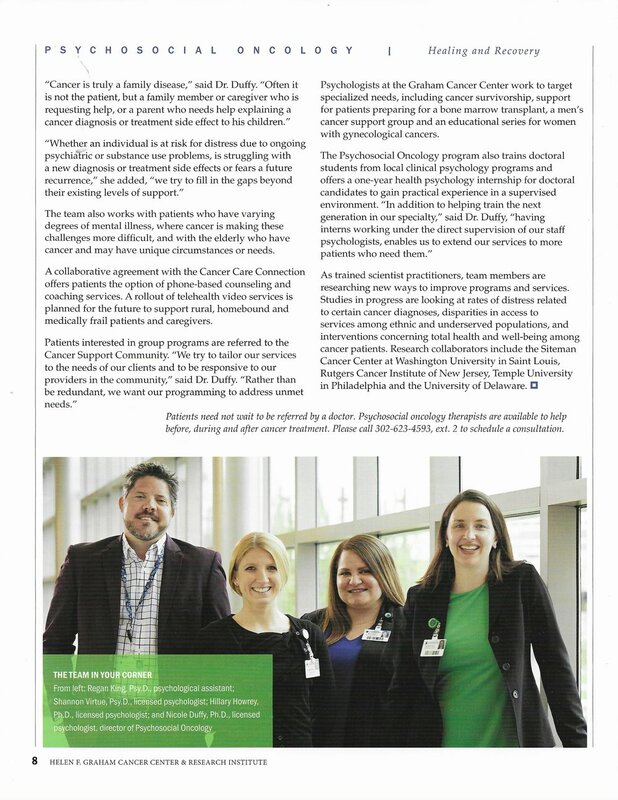 Recently, Dr. Regan King was featured as a part of the Psychosocial Oncology Team at the Helen F. Graham Cancer Center (HFGCC) in Christiana Care Health System's publication Cancer Update. As a part of his doctoral training in Health Psychology, Dr. King spent one year (2012-2013) as a trainee helping cancer patients and their families deal with any mental health concerns during the diagnosis, treatment or post-treatment of cancer. Dr. King also helped families grieve the loss of loved ones to cancer. Two years ago, he was asked to come back and support the team for a brief period during one of the Psychologist's leave of absence. Three months turned into one and a half years! In addition to resuming the responsibilities stated above, Dr. King provided support to cancer patients and their families who were admitted to Christiana Care Hospital for treatment. He also consulted with newly diagnosed patients with varying cancers and their families at the HFGCC's Multi-Disciplinary Centers in an effort to provide comprehensive, integrated care. Cancer psychology can often be helpful for newly diagnosed cancer patients who have pre-existing mental health difficulties, individuals who experience emotional distress as a result of the cancer diagnosis, and/or for families of patients who are not quite sure how best to help their loved one. Often individuals who experience life-threatening illnesses benefit from having a confidential relationship with a mental health professional who is familiar with the impact of cancer. Patients sometimes appreciate having an outlet to explore their many thoughts and feelings that accompany this health challenge. If you feel as though you or someone you may know would like more information, click on the "Meet the Therapist" tab and contact Dr. Regan King at (443)420-8655. Check out the Cancer Update feature below!